The U.S. government may be footling with fantasmagorical Web 2.0 toys for citizen empowerment, but over in the U.K., ladies and jellyspoons, the new Prime Minister has his finger on the pulse. He’s been webchatting with Mr. Facebook. 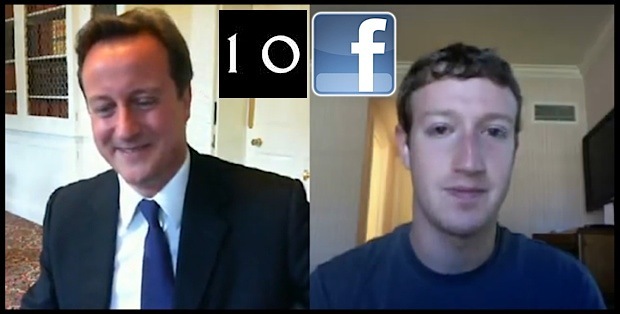 The Prime Minister David Cameron, looking spiffy and smart (with a slightly badly knotted tie, to show he dresses in the morning like the rest of us) recently conducted a videochat with Facebook CEO Mark Zuckerberg on the benefits of Web 2.0 social network connectivity, and how it can help connect government officials and the man in the street in ways that have never been possible before. It’s lofty stuff, and Cameron’s enthusiasm for a mechanism that lets the public share opinions directly upwards into the authorities’ structures will feel like a breath of fresh air for the forward-thinkers among you. He even imagines there’s a “civic spirit” among the British populace. Okay, so Cameron’s benefiting from a centuries-old backdrop inside historic Number 10 Downing Street, some excellent TV-quality lighting and an easy and affable nature in front of the camera. But Zuckerberg’s dimly-lit face, bluish thanks to the tinge of light from his Mac’s screen, his plain T-shirt and apartment in the background just don’t quite balance the other party in the conversation. You’d think a billionaire could do a smidge better when talking to a globally important political leader. And Mark–dear Mark: The folks in the British government and a nation of some 60 million souls aren’t “you guys.” That’s not really how you fan the flames of cross-Atlantic friendliness. At least Zuck’s able to do one thing: Deliver a handy mechanism for the U.K. government to chat to its people for free. With adverts.